A popular attraction at Japanese festivals is the performance of taiko drummers. Their stirring pounding of their huge instruments rouses crowds and adds a unique Japanese flavor to the atmosphere. Everyone is drawn to these compelling spectacles. I first went to the Rafu Ki-in (Los Angeles Go Club) in 1974 where I met Richard Dolen. He used to give go lessons in the club using a large demonstration board every week. I also went to UCLA, which had a go club, too. I met several players there who are still my friends. That same year of 1974 I met Professor Christian Fronsdal in the Physics Department and started playing go with him on a regular basis. I still do. The point is that these are people that I still have friendships with more than 40 years later. Not only that, but I have gone to Japan with some of them. I went to Kyoto on two successive years and visited temples and shrines with Professor Fronsdal, who was lecturing at the Institute of Higher Mathematics at the university there. It was a wonderful experience. The point is that the game of go offers many opportunities to make lasting friendships. And for me, I find myself making new friendships all the time. This past Saturday night, my Japanese go club, the South Bay Ki-in, located in the New Gardena Hotel, 1641 W. Redondo Beach Blvd., Gardena, CA 90247 (310) 327-5757, held a bonenkai [忘年会]. This means, “Forget the Year Meeting.” We reminisced about the passing year and discussed the coming year. 90% of the conversations were in Japanese. I interpreted for a new American player who joined the club this past year. We also had a wonderful banquet at a fine Japanese restaurant. I enjoy translating Japanese articles about go, too. That keeps my Japanese sharp and my game strong. I am now 17-8 in the correct club tournament. The game that follows features professionals who are probably unknown to most American go players. That gives the game an exotic feeling. But there is plenty to learn from it as well. Played on October 22, 1975 at the Nihon Ki-in, Ichigaya, Tokyo. 198 moves. White wins by resignation. Analysis by Ishida Yoshio, Meijin in Kido, December 1975. Sato 6 dan was a student of the late Iyomoto [Momoichi, 1919-1974], Honorary 8 dan [awarded posthumously]. His go style, however one looks at it, is a power and fighting game, while Kamimura 6 dan, a student of Kitani [Minoru, who was also the teacher of Ishida] has the reputation of following an orthodox style. 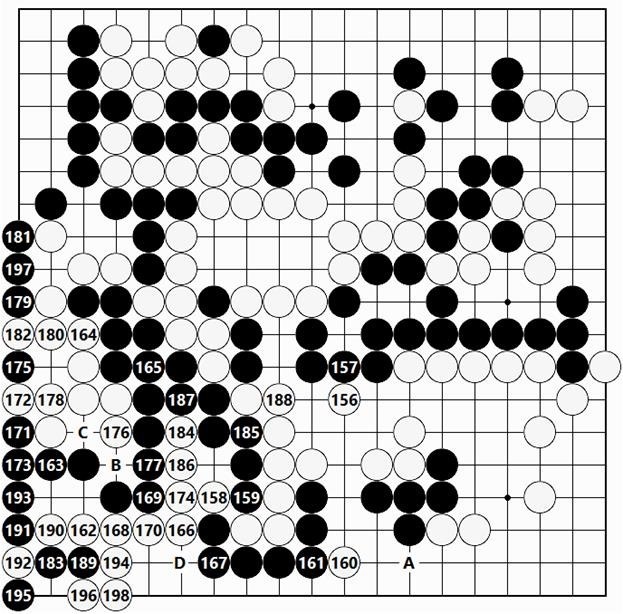 Fighting in go ideally is ushered in at a player’s own pace starting with the opening moves [joban]. The same way as in the floating world [ukiyo, the root of ukiyoe, i.e., “pictures of a floating world,” meaning Japanese prints depicting a transient world according to Buddhism], the nature of floating go [ukigo] is to ignore the bidding of the opponent. In this game, for some reason Sato 6 dan exerted all the power in a one-sided fight. We will trace the causes and effects to find out why. It can be assumed that the motive behind playing the Taisha fencing-in move [kake] of Black 7 is to use it as a ploy against the large komi. This is an indication of understanding the opponent’s inclinations so as to direct the flow of play. After Black extends with 17, White plays atari with 18 as a forcing move and slides [hashiri] to White 20, an order of moves that is unusual. In the world of the “Hundred Variations Taisha,” it is dangerous to make an arbitrary change. The standard order of moves is Black 17, White 20, Black 21, White 18 and Black 19. …filling a liberty with White 1 is most often played. As an example of one variation, there is the swap through Black 16. Following the hane of Black 16, should White save the stones with A, the attachment of Black B makes White’s stones heavy, while the hanging connection of White B would bring White under attack after Black C, White A and Black D. There are many cases of players feeling regret because of this. Appending this is for the sake of warning beginners for their reference. In the end, pressing with Black 21 (as shown previously) returns to the usual course of play. …the jump of White 1 is another method. If Black then jumps to 2, White replies with 3 through 7. Besides that, should Black use 2 to make the extension at A, White hanes at B. …the counter-hane of Black 1 leads to variations that have been used since olden times. One example is the sequence through the extension of White 8. Following this, if Black extends at A, the jump of White B makes the standard shape. …it is usual for White to defend with 1. The sequence through the hane of Black 20 is one variation that can be cited from actual games [played in professional tournaments]. Returning to the figure, the moves from the atari of White 30 to the diagonal move of Black 39 is a new model among the “Hundred Variations Taisha.” Black 39 is an essential move that not only makes good shape for the group, but prevents White from making the fencing-in move of 39. The judgment can be made that up to this point the divvying up of the position is in Black’s favor. However, when White presses close at the vital point of 40, things become difficult. Black challenges White’s outward influence with the attachment of 41, and whether good or bad, an immediate battle cannot be avoided. In reply to the cut of Black 45, descending to White 46 is a strong move that aims at the cutting point of A. Then, the block of Black 47 is uncompromising. Should Black have drawn back at 51, the cut of White A would have been a major headache for Black. In answer to the hane of White 48, jumping to Black 49 is natural. …but then crawling in such a low stance is not something that Kawamoto would ever countenance. The attachment of Black 57 is a questionable move that in an instant makes White thick and strong in the center. Starting with the hane between Black’s stones with White 58, the sequence through White 68 makes life. This is an unbranched path [ippon-michi]. However, the invasion of White B at the 3-3 remains, so in the final analysis this is not satisfactory for Black. …one wishes to jump out with Black 1, but White would dodge lightly with 2, and Black has no play to make to counter that. Pressing with Black 3 would be followed by White A, Black B and White C — this is the technique [suji] for White to escape. Instead of Black 3, should Black make the fencing-in move of D, it would make slack shape, leaving the potential for problems [bad aji]. …White might make the diagonal move of 1, but of course Black would then hane at 2, looking forward to attacking White’s group. It goes without saying that Black 69 is a big point, but through White 66 the group in the center becomes thick and strong. This result is unsatisfactory for Back, and the cause of falling in with Sato’s pace is Black’s seeking momentum with the attachment of Black 57. At first sight, the turning move [mage] of White 70 appear to be a forcing move played in the correct move order, but the result of incurring liberties filled with the exchange of Black 71 for White 72 is that the reinforcement of White 74 cannot be omitted (to avoid Black’s ballooning out with a move at 74), so White 70 is premature. …the jump of Black 1 is solid. With the implication of a Black diagonal attachment at A, this is the real move [honte]. A White invasion at the 3-3 point of B remains, but had this happened, Black would still have scope for fighting. Therefore, the capping move [boshi] of White 78 is a strong move of great merit that strikes at Black’s heart. …keeping White’s stones separated with Black 1 through 5 would be answered by White 2 through 10. In this way White deals adroitly with the situation [sabaki], making the jump of Black 77 the second cause of Black’s loss. The peep [nozoki] of Black 1 is a forcing move played before Black pushes at 3 [actually, the word used here is hai, which literally means “crawl”]. This is the correct order of moves. White can make the hit at the shoulder [kata] with 4, leisurely moving out. This is also possible because of the safe and secure White position in the center. The hane of Black 13 is also a good point that cannot be omitted. Had White been able to extend [nobi] at 13, Black’s positions to the left and right immediately become thin and weak. White continues attacking in good form [kocho] with 18 and 20. 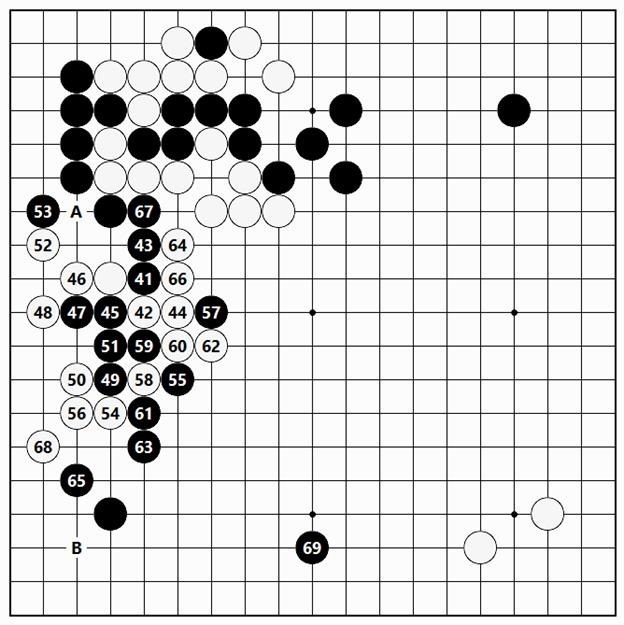 Black attaches [tsuke] at 25 and then makes the hanging connection [kake-tsugi] of 27. This also the correct order of moves. Had Black made the hanging connection of 27 first, the attachment of Black 25 would be met by White diverging with a move at 36. The attachment of White 48 is a fearsome move. If Black negligently defends with 1, White separates Black’s positions with 2 through 6. The hane between White’s stones [hane-komi] of Black 49 is a technique [suji] for survival [shinogi]. White 1 and 3 is countered by Black cutting at 4. Then, White has no alternative but to extend [nobi] at 5. In the race to capture [semeai] that follows Black 6, White’s stones have insufficient liberties. White hanes out with 58, then peeps at 60 as a forcing move. 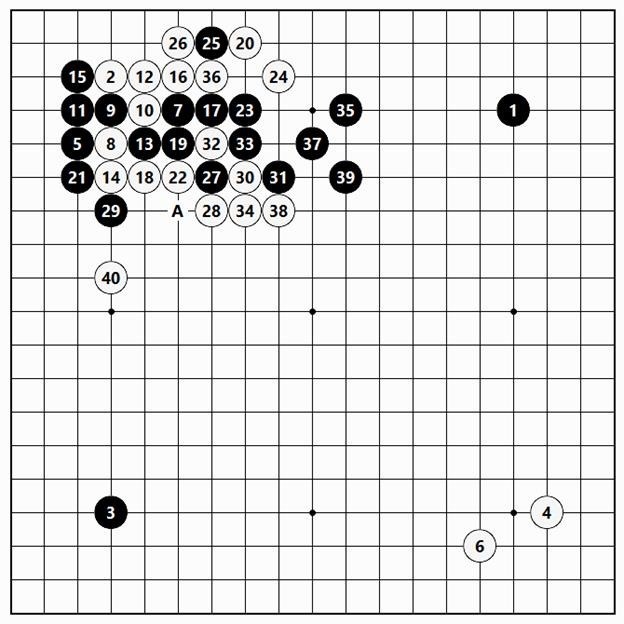 This is a skillful order of moves that leaves White with the possibility of crossing underneath [watari] at A. To the extent that the invasion at the 3-3 point of White 62 is possible, the cut of Black 59 leaves defects [bad aji], but since the outlook in the game is unfavorable, it is impossible for Black to give an inch with any move. Black has to try everything. Instead of Black 65, blocking with Black 68 would completely secure the lower left corner, but the fact is that White’s capturing five stones with a move at 65 would leave Black with an absolutely lost game. …cutting with Black 1 would be a peaceful way of proceeding, but supposing that White answers with the diagonal move of 2, the group is safe and secure. This is a peaceful way of losing the game. Instead of the Black rod-like connection of 77, if Black makes the empty triangle at B, the connection of White 78 is not possible, but White 80, Black 78 and the connection of White C would likewise end in a loss for Black in the race to capture. In response to the attachment of Black 79, the connection of White 80 is calm and collected. Should White carelessly block at 97, the cut of Black 80 produces ko. Black 83 and the following sequence is a desperate attempt to create a race to capture, but the wedging-in move of White 84 is a good tesuji. It refutes Black’s play by bring about a shortage of liberties for Black. …capturing with Black 1 gives scope for making an eye in the corner, but White 2 and the following sequence stifle any attempts at complications. So it could not be avoided. Playing Black 97 as Black D, filling a liberty, makes the position seki for the moment, but White 97 makes life for the White group, settling everything.